Get The Teaching Resources You Need Without Breaking the Bank! Other than teaching, can you think of a profession where employees spend their own money to do their job? I am not saying that teachers are the only ones who do this, but they are the first that come to mind. Teachers know that if we relied only upon the resources provided to us, our students would suffer. So many of us, dig into our own pockets to ensure we have engaging, relevant, and current materials that meet the EXACT needs of our students. What if there was a way to lessen this financial burden on teachers? 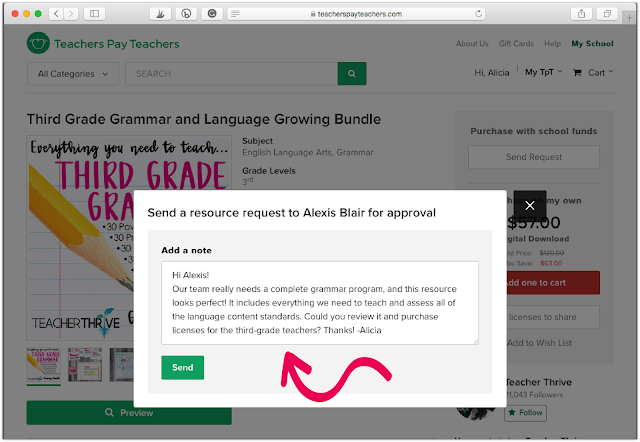 That is the goal of TpT for Schools, a new purchasing platform from our friends at TeachersPayTeachers. Imagine finding the perfect resource on TpT, and instead of buying it with your own money, you click on a "request" button. Your administrator instantly receives a request email where he/she can review and approve the item. Boom! The resource shows up in your account, ready to be downloaded!!! Right now over 1,000 schools doing just this! Can you imagine?! Would you like your school to be part of TpT for Schools? 2. Once an account is set up, your administrator will invite teachers at your school to join the account with their school email address. 4. Your administrator will immediately receive your request to review for approval. Approved resources will instantly appear in your account, ready for download! Think of all the money districts have spent on programs and materials that teachers cannot use. The best administrators understand that as teachers, we know what will and will not work with our students. TpT for Schools puts crucial curriculum decisions into the hands of administrators and teachers. It allows teachers to pinpoint the resources that will perfectly match the needs of their students. 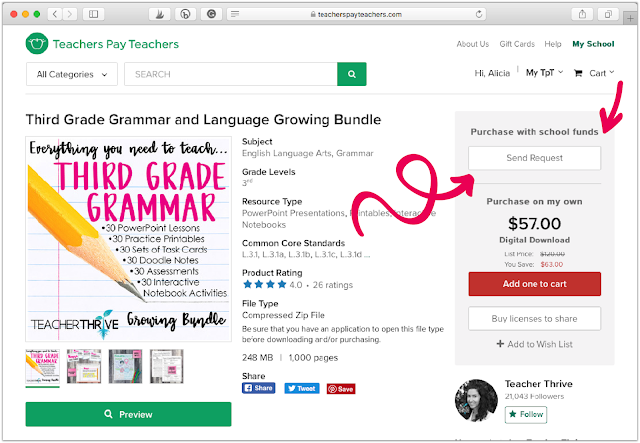 No more waiting for purchase orders, textbook adoptions, or (sadly) your next paycheck for new teaching materials. The future is here with TpT for Schools! Your homework assignment: Talk to your principal or curriculum specialist about TpT for Schools (perhaps with a Starbucks in hand;-) and send them this link, bit.ly/ShareTpTForSchools You can also share this short video with your administrator.